Gearrchoille appears as woodland on Roy's military map of 1750. While the wood has probably never been cleared, it has been modified by grazing, timber harvesting & planting - as well as fire as we found out recently! 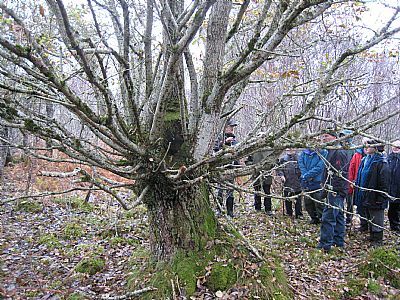 The effects of grazing in the woodland were noted by Peter Quelch in his report on Ancient Wood Pasture. The wood was used for over-wintering cattle till the 1950s, and stock grazed the compartment nearest Ardgay until 2007 when the fence was repaired. The wood has been used for organised recreation since about 1900 - with curling till about 1940, then clay pigeon shooting from then till about 1980. The first work on the footpaths started in the late 1980s. History summary from George Ross. Cattle drovers regularly used the Gearrchoille wood as an overnight stop en route to markets. An old drove road defined by eroded earth banks and ditches runs from Oakwood Place to near Oakwood chalets. The woodland contains the remains of three stone dykes.